Will produce a small bush or tree to 2M tall x 1M spread over 12-15 years. You may have seen them in flower in row after row of trees in avanues in France in Summer - grow them here now! 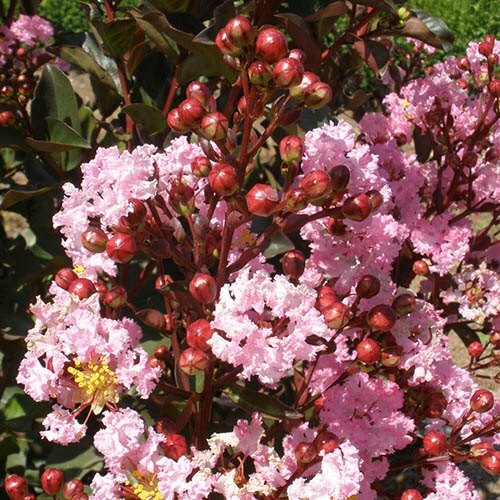 Lagerstroemia have never flowered well in the UK in all but the very hottest Summer’s. They are perfectly hardy and tough over here, they just never got enough accumulated sunshine to flower reliably – until now! Following tests in the UK, the variety ‘Rhapsody in Pink’ flowers reliably in Summer into Autumn in the UK, thanks to the fact it appears to need much less sun to flower than other varieties. Added to that, it has sensational wine purple new leaves, and is smothered in soft pink flowers for long periods, it really is a breakthrough for UK gardeners. A reasonably vigorous grower, it will form a good sized shrub or small tree in a sunny spot, ideal for large pots or specimen plantings. Ensure Winter drainage is good too. A really easy to grow, yet dramatic new plant for British gardens, ‘Rhapsody In Pink’ really delivers.